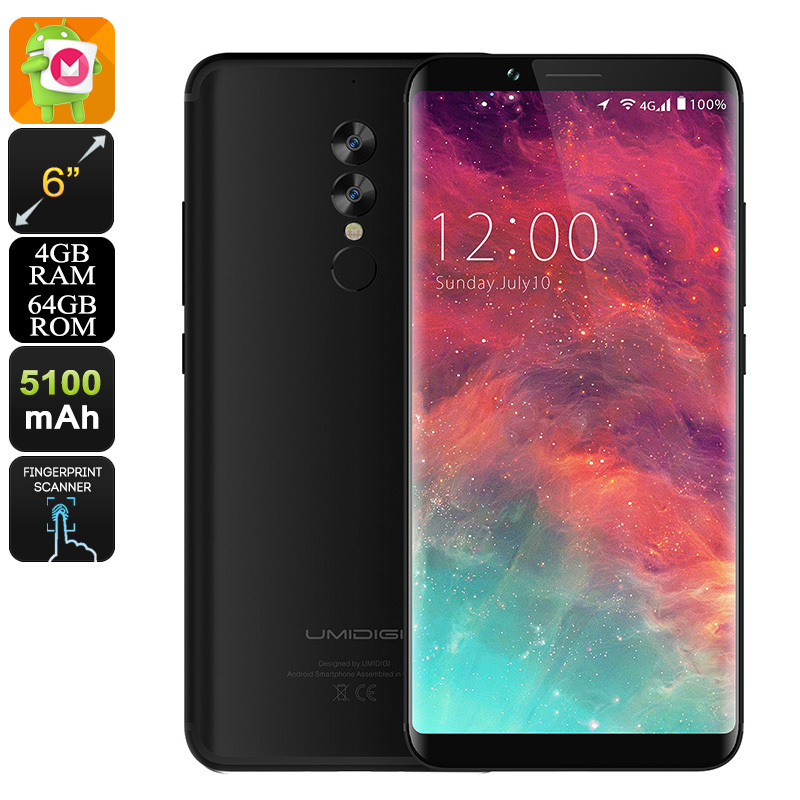 Successfully Added HK Warehouse UMIDIGI S2 Android Phone - Helio P20 CPU, 4GB RAM, Android 6.0, 5100mAh, 6-Inch, 18:9 Full Screen (Black) to your Shopping Cart. The UMIDIGI S2 Smartphone is a remarkable Android phone that does not only look good but also treats you to top-end specs. With its stunning 6-Inch display and metal framed body, this latest Android phone certainly is a feast for the eye. The cell phone features an extremely thin body which gives it a high-end look. Underneath its display, the Android phone packs a state of the art Helio P20 CPU. As an Octa-Core processor clocked at 2.0GHz, this piece of hardware brings forth some significant power. Along with 4GB RAM, you’ll be treated to an outstanding user experience that can be compared to that offered by big brand flagship Android phones. A whopping 5100mAh battery allows this Android phone to run for up to 20 hours continuously. Thanks to this, you’ll be able to get through multiple days of regular smartphone usage without needing to recharge. If you’re into mobile entertainment, the UMIDIGI S2 smartphone is perfect for you. With its 6-inch HD display and advanced GPU, it treats you to stunning visuals. Whether it’s games, movies, or Apps – you’re guaranteed to enjoy the stunning visual experience. To make sure you’ll never run out of storage, the mobile phone comes with 64GB memory and 256GB external storage support. Besides treating you to a powerful performance, this latest Android phone also brings along great connectivity. With its Dual-IMEI numbers, it lets you stay connected to two network providers at once. This allows you to easily separate work and private life while using merely one device. The Android phone supports 4G so you can take advantage of the fastest mobile data speeds available. This allows you to browse the web wherever you are and share videos and pictures with friends even while traveling abroad. With its 13MP Dual-Rear camera, the phone makes sure you’ll never run out of images to share with your loved ones. The UMIDIGI S2 smartphone comes with a 12 months warranty, brought to you by the leader in electronic devices as well as wholesale Android phones..